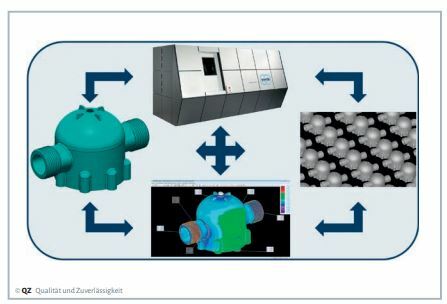 Computed Tomography as an Engine of Industry 4.0: Many companies still develop, produce and inspect their products in separate, non-networked steps. These processes can be simplified and accelerated with coordinate measuring machines using computed tomography. The result is a complete, digital image of the work piece. As the trend toward a digitalized world continues, industrial production, communications technologies, and IT are becoming ever more enmeshed. The term Industry 4.0, familiar throughout German, describes production that is self-organized and monitored to the greatest extent possible, but countries like the USA, China, and Japan are pushing these ideas with terms like IIC or IVI. Networking accross data structures affects all phases of the life cycle of a product, from concept to development, production, use, and maintenance.